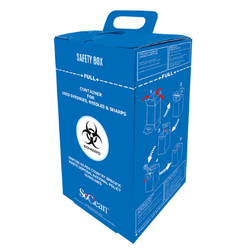 Offering you a complete choice of products which include safety box and sharps disposal safety box. We are the leading manufacturer of Safety Box and our product is made of good quality. 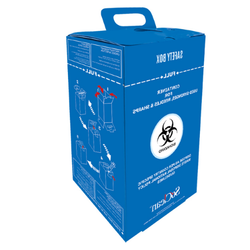 With sincere intentions to preserve and uplift our reach in the industry, we are offering a comprehensive array of Sharps Disposal Safety Box for our customer. Our offered box is highly acclaimed by various industries. Biodegradable board material with Lifting Handle. Sharps aperture to receive Syringes, Needle Assemblies of all standard sizes up to 20m1 and other sharps. Possible to close and seal the aperture any time during use. Stable, spill-proof & damage resistant.